Cooking Italian Recipes is a blog style website devoted to preserving the old family recipes of my Sicilian heritage. Cooking authentic Italian food is easy, fun and delicious! Some of these Italian dishes are new takes on old traditional family gourmet recipes. Here, we will also get into home wine making, review products and comment on wine - food pairings. Enjoy. This recipe is one of the most requested recipes that I receive. That is for good reason. It is fantastic and one of the most often made recipes in my home. Marinara Sauce is my wife's specialty, so I can't take any credit for this. I often say that my Grandmother would be proud of her and her Marinara Sauce Recipe. This Marinara Sauce Recipe is the very best I ever tasted! It has evolved over time, only to get better just when I thought that it couldn't get any better. One of the things about Marinara Sauce is the quality of the tomatoes and their ripeness makes a difference. We use Organic Tomatoes exclusively in our Marinara Sauce. As many of you watch my videos, you have seen my gardens and tomatoes. We use the plum tomatoes, however there are times a few Cherokee Purple tomatoes find their way into the Marina Sauce. 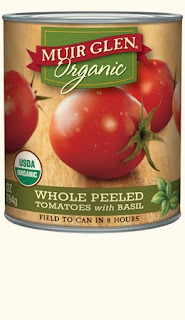 If we have to use tomatoes form a can, we pretty much always use Muir Glen Organic Whole Peeled Tomatoes. One of the changes we have made over the years is that we cook this Marinara Sauce Recipe in a crock pot. We used to cook it in a very large pot on the stove, but the Crock Pot does a better job. After it is complete, we usually end up with 6-8 quarts of some of the best Marinara Sauce ever. Sometimes we can it in quart mason jars, but most of the time we just keep a quart or two in the Refrigerator and freeze the rest. Another important note in making this marinara sauce recipe is that we uses peeled whole tomatoes. We cook the tomatoes whole and it is only at the end of the cooking process that we smash them with a potato masher. This change greatly improved the quality of the marinara sauce, which went from super amazing to out of this world stellar amazing... The reasoning for this is smashing the tomatoes early make the sauce too bitter, due to the seeds. 1 1/2 cup of a hearty Red Wine, like a burgundy. Saute the onions until they are translucent and then add the garlic in the best olive oil you can find. Take care not to burn the garlic as if you do... Throw the whole thing out and start over. After the garlic and onions are sauteed, add them to the crock pot ( or pot on your stove ). Next, add all of your peeled tomatoes to the crock pot. It is starting to look like Marinara Sauce already! Pour in the wine. The next step in making the Marinara Sauce is to put the dried spices on top. Then, simply put the top on your crock pot and turn it on. After some time, it will start to liquefy and boil. When that happens, you can gently stir in the spices, taking care not so smash the tomatoes. After it simmers for a few hours, place the lid ajar, so that steam can escape. This will produce a thicker marinara sauce. Now, let the Marinara Sauce simmer for another few hours. When the Marinara Sauce has simmered for several hours, then it is time to smash the tomatoes. We like a chunky and rustic marinara sauce. So, that is when I mash the tomatoes with potato masher. If you want a smoother sauce, you can probably use an immersion blender, but that would be a crime.. The texture of the marinara sauce with chunks of tomatoes in it by using the potato masher is part of what makes this marinara sauce recipe so wonderful. Finally, it is time to serve. My family enjoys this marinara sauce recipe on virtually any Italian dish. Meatballs, Chicken Cutlets, Manicotti , eggplant and lasagna. I hope you have enjoyed learning how to make this Marinara Sauce Recipe. It is my wife's specialty and she deserves all the credit here. I would highly recommend giving it a try. Hello! Is this the same recipe you follow for pizza sauce? No, for Pizza Sauce, I like to use something more mild. With Garlic, onion and a little Olive oil, Basil and Oregano. You can use the Marinara Sauce, but it will be a bit robust. Thanks. Any chance you will do a YouTube video of your pizza sauce? My husband is a perfectionist and we tried your dough recipe and it was the best we ever had. We are just using pureed Cento tomatoes with no seasoning, but he adds garlic powder, oregano, tyhyme and basic, all dried. Sauce is too runny though and gets the pizza floppy. Sounds like he is putting too much sauce on the pie.. You only need a thin coating. You can also just get diced tomatoes, strain them, and just put that on spread around... No need to even pre-cook it. You can then add some chopped garlic and sprinkle some spices on top.. When it comes out of the oven, tear up some fresh basil and top with it. Enjoy. 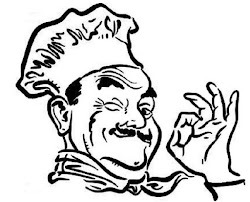 Welcome to Cooking-Italian-Recipes.com! This blog is dedicated to the Italian cooking that I grew up on, Italian wine making and family traditions. As a child, growing up a Sicilian, in New York, the aromas of this fine cooking permeating my home were an everyday occurrence. Getting to eat this fine Italian Cooking, from Grandma, I quickly became spoiled. Here, I will share my modern day experiences, re-creating in the present from the memories of the past. I think what makes this website different from others like it, is that I am just a regular guy. I am not a chef, nor do I do I cook for a living. You will not find me on Food Network! Not that I think there is anything wrong with Food Network... The point being is I am not some famous chef on TV. Just a regular every day Sicilian guy with no formal chef training. So, if I can cook these Italian recipes, so can you! No special skills or training is required. All of the Italian recipes I present here are simple. When I cook, most of the time, I believe less is more. I don't like to over complicate dishes. Flavors, in my opinion, should not compete with one another, but should support and enhance each other. Gourmet doesn't have to be complicated. It should be defined with that it tastes good. Please feel free to give my Italian Recipes a try... Modify them as you wish. And, if you enjoy them, please pass them down to your children and grandchildren! Build family traditions and memories around these Italian dishes. As my grandmother used to say, Italian food is about love. To the memory of my Grandmother, I dedicate this site. Here you will find items hand picked by me! By purchasing from my Amazon store, you will be helping out a nice Siciliano boy! Grazie! If you like this blog and use Facebook, please take a moment to Like us! Copyright 2012. Simple theme. Theme images by funstickers. Powered by Blogger.